A wave of shootings in the Irish Channel that may be connected to an attack on a school bus last month and another outbreak of gun violence in the Central City area led to a joint operation of more than 40 officers being deployed to find the shooters and suppress the gunfire, authorities said this week. 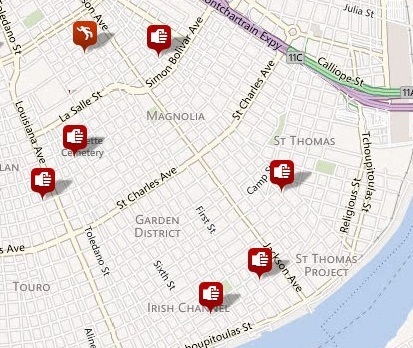 The Irish Channel area saw at least three shootings in as many days last week, including one at hotspot at Chippewa and Washington, another shooting in the 600 block of Soraparu and one more just a few blocks down at Hastings Place and St. Mary. At Chippewa and Washington, at least a dozen rounds were fired May 2 between what appeared to be juveniles in a silver Range Rover and a dark-colored sedan, and on Soraparu, the victim was walking toward a red car on the street when he was fired upon, said Sgt. Sabrina Richardson of the NOPD Sixth District persons-crimes unit. It’s unclear whether any of the shootings are related to one another, said Commander Bob Bardy Thursday at the weekly meeting of the Sixth District leadership. The shooting at Chippewa and Washington is believed to involve the same suspects who fired on a school bus passing through the Channel last month, but the victims in that case refuse to identify their attackers, so that connection cannot be confirmed either, said Lt. Frank Young of the district investigations unit. Central City has also seen a wave of shootings over the last two weeks. Norris Gray was shot to death May 1 in front of more than a dozen children at a party on Second Street; another shooting was reported the same night on St. Andrew Street; and another man was critically wounded May 3 in a shooting on South Saratoga. The Gray murder has some definite suspects and the investigation is progressing, Bardy said, and the St. Andrew Street case appears to have stemmed from a fight between several young girls. In the Saratoga Street case, investigators believe they have identified the suspect, but have been unable to get confirmation from witnesses, possibly because of an outdated lineup photograph, Bardy said. The Sixth District’s task force has been concentrating on both the Irish Channel and the Central City areas, and Bardy recognized two task force officers, Lucretia Gantner and Devin Ashmore, for making two vehicle stops that each led to the discovery of signficant stashes of heroin and cocaine by known players in the Uptown violence. And on Thursday, Bardy supplemented the district’s task force and narcotics officers with state Alcohol, Tobacco and Firearms agents and members of the city’s Special Operations Division, creating a team of 40 agents deployed into the Irish Channel and Central City, looking for more of the individuals behind the shootings. In Central City, the current hotspot seems to be along St. Andrew Street, and in the Irish Channel, the focal point of violence continues to be around Chippewa and Washington, Bardy said. Police are also continuing to investigate an incident at Walter L. Cohen High School on Dryades Street in the Milan neighborhood, in which a teenager drove up to some students outside, showed them a gun and told them that if they weren’t at the school, he’d shoot all of them, Richardson said. That suspect has been identified as someone also suspected in a string of robberies in Jefferson Parish, Bardy said. Finally, one other shooting reported in the Sixth District, said by the victim at the hospital to have taken place at Claiborne and Earhart, has since been determined not to have happened there, Richardson said, and appears to have taken place somewhere on the Westbank. It is obvious that the NOPD is unable to “protect” OR “serve” the citizens of New Orleans. The only way out of this horror is to deputize the Louisiana National Guard to allow them to carry loaded weapons and to make arrests. Although our common enemy consists of seemingly random thugs, murderers, and child abusers, they do have a common agenda: to destroy the civilized portion of our city. They are engaging in acts of terrorism. Don’t we still have a “war on terrorism”? If nothing is done, soon, the terrorists will have taken over our community, if they haven’t already. When residents are afraid to go out at night and children are afraid to go to school and we begin to lock ourselves in our homes, even in the daytime, then some drastic measures have to be taken. None of us want “martial law”, but BY GOD, we need HELP! I suggest that NOPD move Its speed trap at Religious & Market streets to Washington & Chippewa, and relocate Its other speed traps into the Irish Channel and Central City. The fat cigarette addicted career police corporal with the lisp might actually do some public good there, and he could still write all kinds of speeding tickets. I am, as always, serious. We are living in a different world today. The junkie, thief, burglar and even drug dealer of yesteryear seldom fired their weapons. It was only when needed for what they perceived their own self preservation. They did not want jail and jail wasn’t a badge of honor. And by and large, they enjoyed their freedom…..Always wanting to make sure they did not attract attention nor leave their family behind by going to prison. These young kids are just different. They don’t care and value nothing. They really don’t get it. Maybe they have no hope for a future…Who really knows. But we are going down uncharted territory, and I think it’s a bit naive to think the police can prevent these shootings from happening. All they can do is react in most cases. Correct on all counts, Tim. One has only to look at the faces from WWL’s web site to see the terrible lack of…..anything. There is nothing behind those eyes but the same look you might notice on the animals in the zoo. At best, the expressions say, “So WHAT?” There is no look of concern or worry even that they have been arrested. We all know many people who had to grow up in dire conditions, bur somehow had the intelligence to see another way out. Extreme poverty, uncaring or absent parents, even physical abuse did not keep some individuals from achieving a better life, often rising to the top of their chosen professions. Education can open a whole other world, but one has to show up to find that out. Being able to READ can save a life.